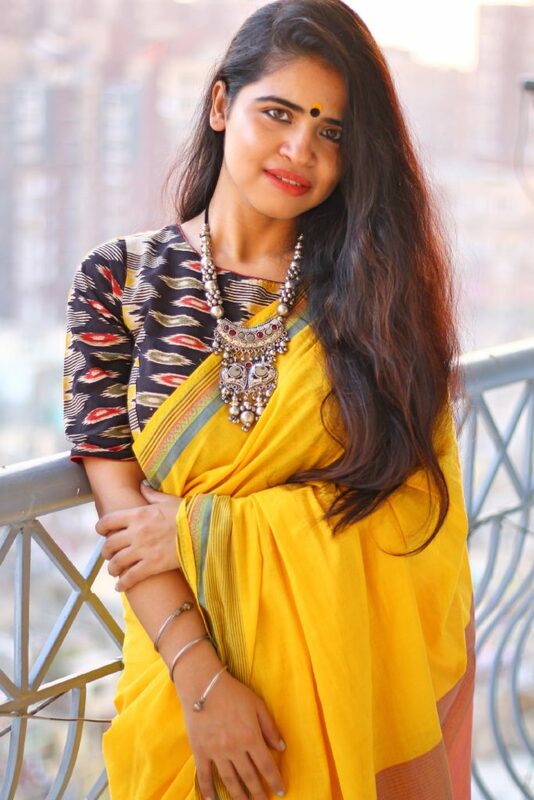 After completing one year of blogging I am finally doing a saree post and what took me so long I really don’t know! As much as I love sarees I will confess one thing I am bad at draping them, yes you heard me right. It takes a lot of effort from my side to drape a saree and even after that I need a help (LOL). 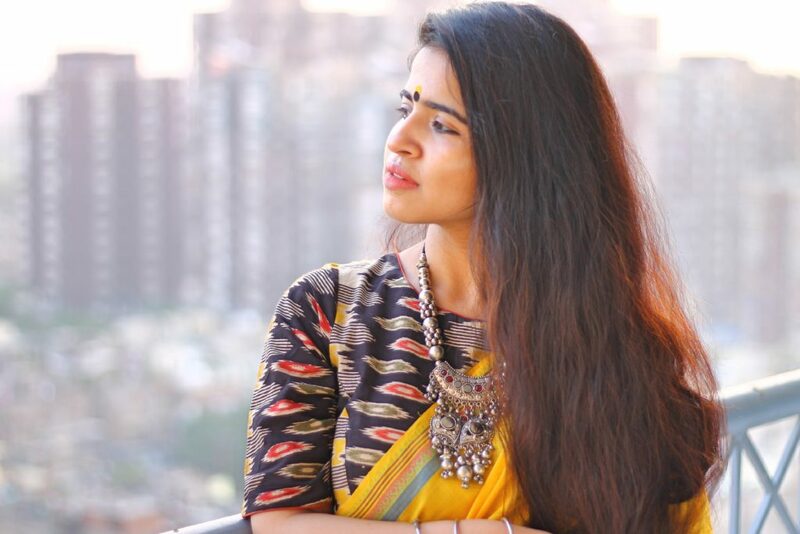 Lack of practice and patience is the only reason why in spite of loving sarees so much it took me so long to do a saree post. Well, this my weak area and I need to work on it. Coming from a family where all women including my mother and aunts are expert at draping saree, it is quite ironical that I am not! 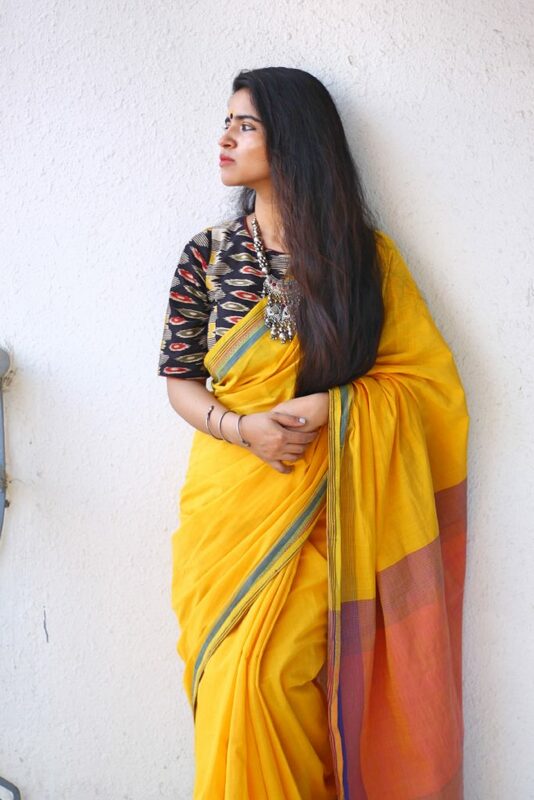 Having said that I do wear sarees off and on, as per my experience wearing a cotton or silk saree is way easier than wearing those embroidered sarees. 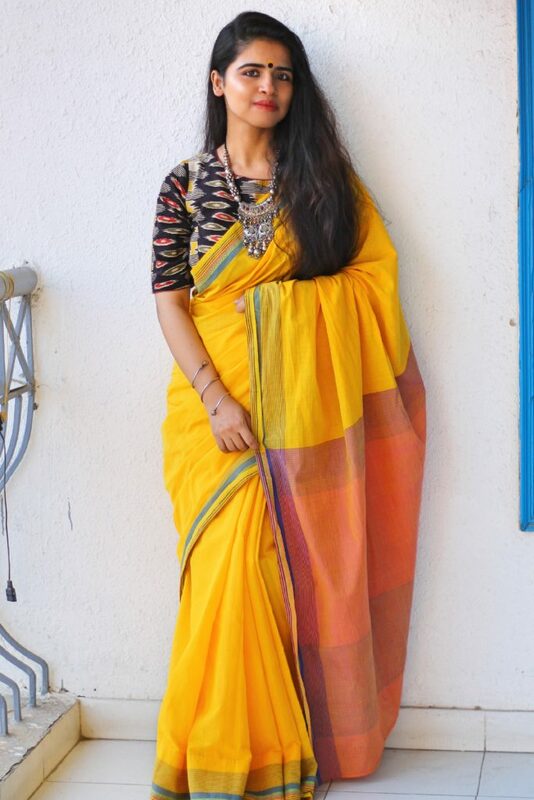 I love handloom cotton and silk sarees way too much and whenever I see someone wearing them I feel like I should own one! Indian sarees are an epitome of grace and class and a perfect exemplification of what Indian fashion entails. If you don’t wear a saree in India you don’t know fashion (just joking!). But women should know how to wear a saree (including me) because it is sheer beauty and fine symbol of our culture. 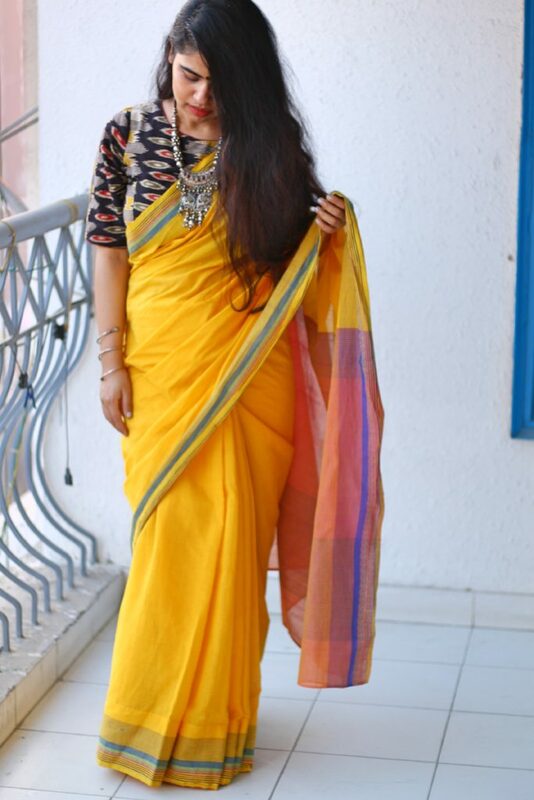 Coming to my saree look, the weather is still in a mood for handloom cotton, so I chose a bright yellow handloom cotton saree for this blog. Yellow is my happy color, I love how beautifully it stands out in summer weather. I paired my saree with a black ikkat cotton blouse with an interesting back design. A bindi and a silver-tone necklace completed my look. Well, I wanted to tie my hair but somehow it didn’t work the day I shot this post, so yes I kept them open. A simple ethnic look which you can wear easily on a casual outing! Style tip: Let us wear more and more sarees on an everyday basis and flaunt them with panache. 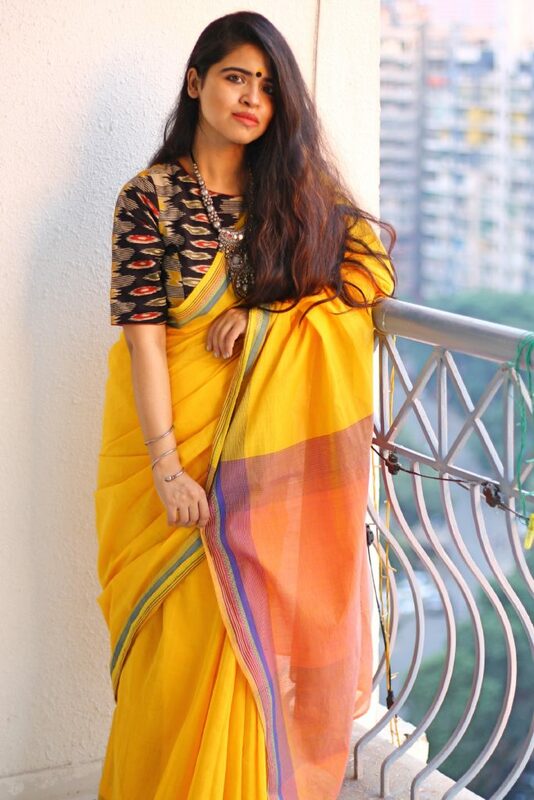 I hope to master the art of wearing sarees soon because I would love to do more saree blogs here! Tell me your saree story in the comments section below! Thanks for showing that yellow saree. You are looking so beautiful like sunshine. Keep uploading more such contents. Such a nice look. 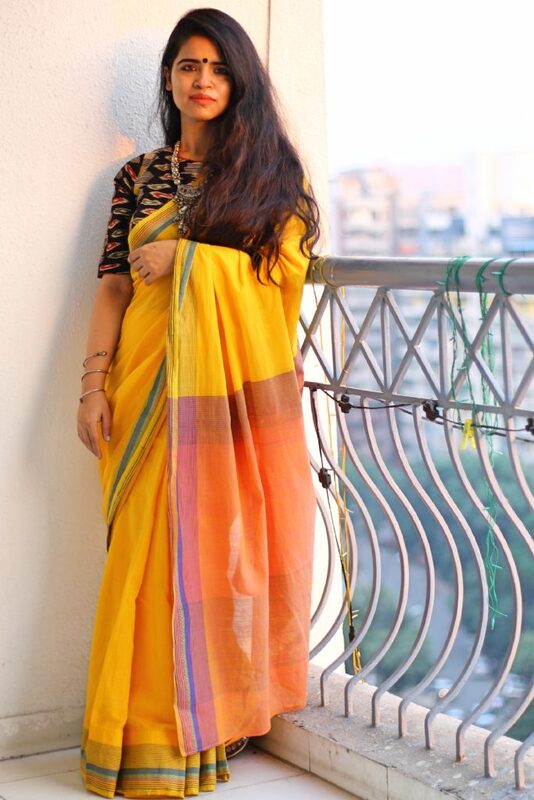 Yellow is a happy colour and sarees in yellow colour look great. It was too good and you are looking gorgeous. Thank You for sharing. Nice Combination…Saree is beautiful and you look gorgeous.